While sidewalks are an essential part of public space in cities everywhere, how local governments finance, develop, and maintain sidewalks depends on the local context. Photo by Asher Isbrücker/Flickr. Planning, construction, and maintenance: These are the three basic steps to ensuring that a sidewalk has a long life. Orphaned sidewalks are common in cities worldwide because it’s often unclear who is responsible for each of these steps. In some cities, this responsibility lays with the owner of the adjacent property, in others the government, and in some places ownership is divided between the two. In Brazil, most local governments place responsibility on property owners. But in a virtual poll conducted in 2012, 61.5 percent of respondents indicated that the task of sidewalk development and maintenance should be the job of city government. If the city is responsible for road space dedicated to vehicles, why should it not also be accountable for the space dedicated for pedestrians? The fact is that walking, while still the primary way most urbanites get around from day to day, has been receiving less attention than ever before. In attempts to reverse this unsustainable trend and encourage more walking, many cities are reexamining the role of sidewalks. Here’s what a few of these world cities are doing to increase walkability and accessibility. In New York City, property owners are responsible for installing and maintaining clean sidewalks. Still, the NYC Department of Transportation (NYC DOT) inspects sidewalks and if property owners don’t meet standards, the city can hire private contractors to make repairs at the expense of the property owner. Similarly, residents of São Paulo, Brazil are responsible for their sidewalks. However, the city maintains sidewalks along public buildings and arterial roads. In January 2008, the city passed a law stating that it is the government’s responsibility to maintain the most heavily trafficked sidewalks, like those near transit hubs. In Porto Alegre, Brazil, the project “Minha Calçada: Eu curto, Eu cuido”(“My Sidewalk: I like, I care” in English) seeks to educate the public about their responsibility for preserving sidewalks, providing a booklet with illustrated information. The project is divided into stages, focusing on one or two city districts per month. Property owners are notified if repairs are needed. If repairs don’t occur within 60 days, the city will perform the work, charging a 30 percent fee to the property owner the next month. São José dos Campos, Brazil created its own program to improve sidewalk conditions. Its Safe Sidewalk Program, a 15-person community group whose members were between 61 and 70 years old, works to raise awareness among residents and business owners. Since the campaign began in 2007, the group has made approximately 30,000 visits, resulting in more than 120,000 square meters of sidewalks repaired. In the 1970s, Los Angeles received a federal grant and took up the obligation to repair its sidewalks. A few years after the money ran out, the city ran into unsavory public opinion when transferring responsibility to property owners. As a result, about 4,700 of Los Angeles’s 11,000 km of sidewalks were in need of repair by 2010. Today, property owners perform most repairs, but the city is still responsible for damage caused by tree roots—one of the city’s most frequent problems. Austin, Texas took over responsibility for sidewalk maintenance in the mid-1990s, but the city never had a funding strategy that could generate enough revenue to ensure a high level of accessibility. By providing a federal regulatory framework, The Americans with Disabilities Act, signed in 1990, has helped fill this gap, ensuring that all residents—regardless of physical capacity—have access to pedestrian infrastructure at the city level. Residents in Washington, DC can report any sidewalk that needs service, specifying the location, type of pavement, and severity of the problem. The city ensures an investigation within ten days, but warns that more labor-intensive repairs depend on what resources are available. London repairs about 1,500 km of sidewalks a year, investing more than $1.5 million annually. Officials even expect available resources to increase, enabling the city to improve 4,000 km of sidewalks with known issues. Permanent repairs can take up to four years. The residents of Madrid, Spain also face delays in having their sidewalks repaired. 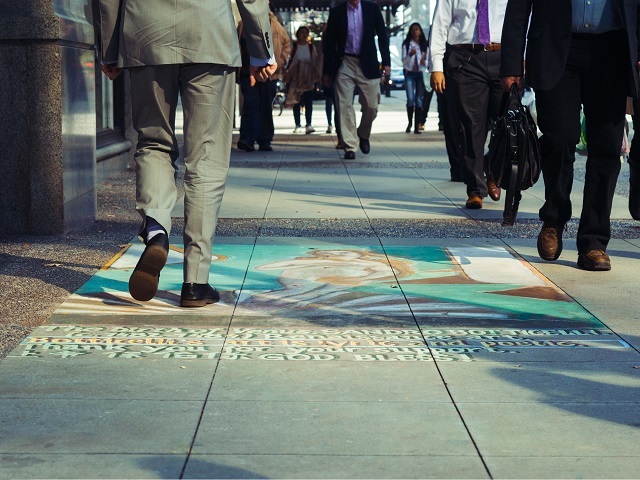 The city’s Master Plan for Road Infrastructure provides funding for complete remodels of nearly 6 million square meters of sidewalks by 2016. With this investment, the city hopes to be able to meet the demand for quality pedestrian infrastructure, enabling residents’ active participation in city life. In San Diego, California, repairing sidewalks damaged by traffic collisions involving governmental vehicles, flooding or water leaks, and public tree roots is the city government’s responsibility. When the damage is the result of private car traffic, tree roots, or private drainage systems, the responsibility lies with the property owner. Damage caused by bad weather must also be repaired by the owner, but a city program covers 50 percent of the costs. Additionally, in 2014, the city organized a group of engineering students from local universities to make repairs over an area of more than 8,000 kilometers. Memphis, Tennessee also provides public assistance to property owners who cannot afford to shoulder the maintenance of the sidewalk. The city helps out individuals who either have a total family income less than or equal to $25,000, are disabled, or fall below the poverty line. The city estimates that about 2 percent of the population meets at least one of these criteria. The question of who should be financially responsible for sidewalks is a contentious issue. The discussion hinges not only on economic conditions, but also technical and political factors as well. Regardless of how they are funded, it’s important that sidewalks be recognized as vitally important to city life, as they contribute to the safety, mobility, and economic well-being of residents.